One of the most exhilarating things Heidi Weiskel hears before a business trip: Pack your boots. That means fieldwork, and whether it’s studying snails in San Francisco Bay or trying to protect endangered mangroves in Panama, the sights, sounds and science of habitat exploration and preservation are more mission than job for this marine ecologist. 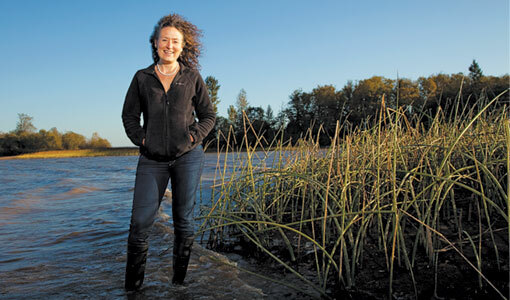 After graduating from Tufts with a master’s degree in animals and public policy in 2002, Weiskel quickly decided she “wanted to be the scientist offering the expert opinion.” She earned a Ph.D. in ecology at the University of California, Davis, and in 2012 started work as one of three scientists at the Environmental Law Alliance Worldwide, a nonprofit based in Eugene, Oregon, that provides science-based evidence and legal advice to lawyers and activists in 70 countries working to protect endangered environments and the people who depend on them. Already Weiskel has traveled from Baja to Belize to Panama. In Baja she advocated for measures to protect marine organisms from brine and cleaning substances that would have been discharged from a large desalination plant proposed to support mining operations. In Belize she worked with a coalition trying to create a protected environmental corridor along the Mesoamerican Reef, a diverse ecosystem stretching 620 miles from Mexico’s Yucatan Peninsula to the Gulf of Honduras that is is threatened by development, pollution, tourism and overfishing. In Panama, the environmental insults were perhaps most heartbreaking, she says. Rampant construction, both completed and planned, has ecologists alarmed—high-rises, luxury housing and tourism development projects that would destroy dwindling mangrove habitats, an elevated highway to be built across Panama Bay, and a massive open-pit copper mine to the north that could devastate 25 square miles of what Weiskel calls “spectacular rainforest” in the Mesoamerican corridor. Just before Weiskel arrived in Panama last May, a high-court ruling on a lawsuit brought by developers stripped Panama Bay of its protected status, opening up to unfettered development what Weiskel calls “an exceptionally critical place environmentally.” The bay, she says, is “one of the greatest places for birds to gather in the world,” a life-supporting annual stopover for an estimated one to two million migratory birds that forage and rest there on their flights between North and South America. Mangrove forests, with their labyrinths of roots, frame Panama Bay and offer protective nurseries for a diversity of marine species that sustain those migrating birds and other wildlife as well as the economically critical local fishing industry. Mangroves act as buffers against storms, floods and erosion, and they filter urban pollution before it enters the marine food chain. Among Weiskel’s challenges is balancing economics and environment—“helping people imagine the connections between ecosystems and human health [and] explaining the severity of potential consequences in a complex world in which species depend on each other for survival,” she says. Weiskel’s doctoral research focused on how increased levels of nutrients, primarily from fertilizer runoff, affect competition between invasive and native species of mud snails, disrupting ecosystems. She discovered a population of the Japanese sea snail Batillaria attramentaria in San Francisco Bay; the invasive species is thought to have hitchhiked on oysters used for regional aquaculture. Her environmental conscience was nurtured on a farm in Leverett, in western Massachusetts, where she grew up. During summers, the family visited Star Island, off Portsmouth, N.H., which has offered educational retreats for more than a century. Generations return year after year (her parents met and married there). The best part: “We were free to eat kelp, run around, tease each other with crabs, figure out what all that sea life was about,” she says.